Click to view or hide contents. CNN Headline News - Local Edition for Los Angeles & Southern California with host Brad Pomerance. Segment aired on Channel 49 at various times between Oct 4 - 10, 2010. Fred Stawitz Interview on CNN Headline News from Fred Stawitz on Vimeo. 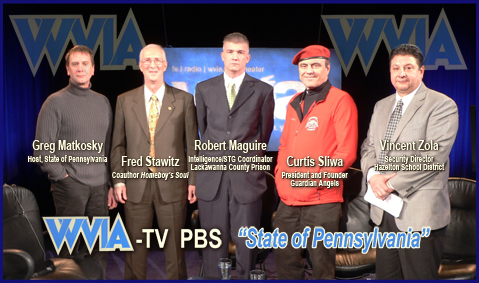 PBS Special "State of Pennsylvania - Gangs in Northeast Pennsylvania: Why and What You Can Do?" with host Greg Matkowsky and guests Curtis Sliwa (President and founder of Guardian Angels), Robert Maguire (Intelligence/STG Coordinator, Lackawanna County Prison), Vincent Zola (Security Director, Hazleton School District). Segment aired live on WVIA-TV PBS; Pittston, Pennsylvania; Dec 16, 2010. Click here to play the promo. Click here to play the program. Viva Houston! 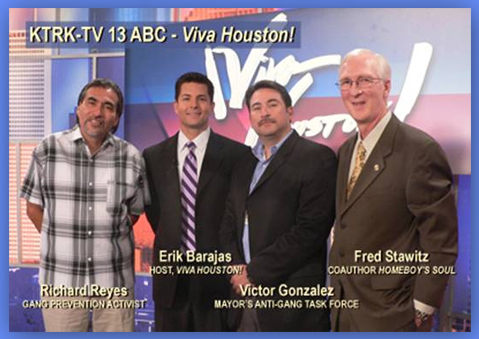 with host Eric Barajas and guests Richard Reyes (gang prevention activist and PanchoClaus) and Victor Gonzalez (Program Services Director, Houston Mayor's Anti-Gang Task Force). Segment aired on KTRK-TV 13 ABC; Houston, Texas; Jun 27, 2010. Click here to play Viva Houston, Segment 1, June 27. Click here to play Viva Houston, Segment 2, June 27. KCAL-TV 9 Afternoon News with anchors David Gonzales and Sandra Mitchell. Segment aired live on KCAL-TV 9 CBS; Los Angeles, California; Sep 10, 2010. 13 WHAM News This Morning with anchor Evan Dawson. Segment aired live on WHAM-TV 13 ABC; Rochester, New York; Jun 28, 2010. Click here to play the interview (Homeboy's Soul segment begins after a brief commercial). The Jim Bohannon Show with host Jim Bohannon. Segment broadcast live on this nationally syndicated program that airs on 400 stations. Broadcast from WestWood One Studios in Washington, DC; Jul 12, 2010. (This clip recorded on WWWT-AM 1500). Fred Stawitz Interview on The Jim Bohannon Show from Fred Stawitz on Vimeo. The Mike Siegle Show with host Mike Siegel. Segment aired live on CyberStationUSA; Seattle, Washington; 2010. Fred Stawitz Interview on The Mike Siegel Show from Fred Stawitz on Vimeo. The John Carney Show with host John Carney. Segment aired live on KMOX-AM 1120; St. Louis, Missouri; 2010. Fred Stawitz Interview on KMOX-AM 1120 from Fred Stawitz on Vimeo. Wine Country con Sabor with host Sandra Gonzalez. Segment aired live on KVON-AM 1440; Napa Valley, California; 2010. Fred Stawitz Interview on KVON-AM 1440 from Fred Stawitz on Vimeo. Urban Journal with host Keith Murphy. Segment aired on Sirius/XM Satellite Radio Channel 169; Milwaukee, Wisconsin; 2010. Fred Stawitz Interview on Urban Journal from Fred Stawitz on Vimeo. AM730 Morning Show with host Birga Alden. Segment aired live on KDAZ-AM 730; Albuquerque, New Mexico; 2010. Fred Stawitz Interview on KDAZ-AM 730 from Fred Stawitz on Vimeo. Late Afternoons with host Mike Schikman. Segment aired live on WSVA-AM 550; Harrisonburg, Virginia; 2010. Fred Stawitz Interview on WSVA-AM 550 from Fred Stawitz on Vimeo. Jones & Company with host Basheer Jones. Segment aired live on WERE-AM 1490; Cleveland, Ohio; 2010. Fred Stawitz Interview on WERE-AM 1490 from Fred Stawitz on Vimeo. The Interview Show with host Phyllis Hall. Segment aired live on KXLO-AM 1230; Detroit/Toledo; 2010. Fred Stawitz Interview on KXLO-AM 1230 from Fred Stawitz on Vimeo. Nuestra Palabra with host Tony Diaz. Segment aired live on KPFT-FM 90.1; Houston, Texas; 2010. Fred Stawitz Interview on KPFT-FM 90.1 from Fred Stawitz on Vimeo. AM Mayhem with host Tommy Briggs. Segment aired live on YES-FM 89.3; Detroit/Toledo; May 11, 2010. Fred Stawitz Interview on YES-FM from Fred Stawitz on Vimeo. Morning Magazine with host Michael Clish. Segment aired live on WFAW-AM 940; Madison/Milwaukee (Fort Atkinson); May 12, 2010. Fred Stawitz Interview on WFAW-AM 940 from Fred Stawitz on Vimeo. Bulldog and the Rude Awakening Show with hosts The Dude and Biggler. Segment aired live on WOCM-FM 98.1; Ocean City, Maryland; May 14, 2010. Fred Stawitz Interview on WOCM-FM 98.1 from Fred Stawitz on Vimeo. May 6, ThuFred Stawitz, expecting a serious discussion of Homeboy's Soul and gangbanging, gets punk'd by hosts Woody & Rizzuto who recruited their morning drive-time audience the day before to join in on the joke. Fred Stawitz Punked on KPNT-FM 107.5 (The Setup) from Fred Stawitz on Vimeo. Fred Stawitz Punked on KPNT-FM 107.5 (The Interview) from Fred Stawitz on Vimeo. Homeboy's Soul earns "Honorable Mention,"
AVAILABLE TO ALL MEDIA OUTLETS. Please provide your name, company, location (city & state for domestic press; city & country for foriegn press), and type of media with email REQUEST.